In the heart of San Juan, in fact, a few miles from the air base where Trump gave his thumbs-up report on progress without mentioning the sharp criticism the federal response has drawn. Trump pledged an all-out effort to help the island. 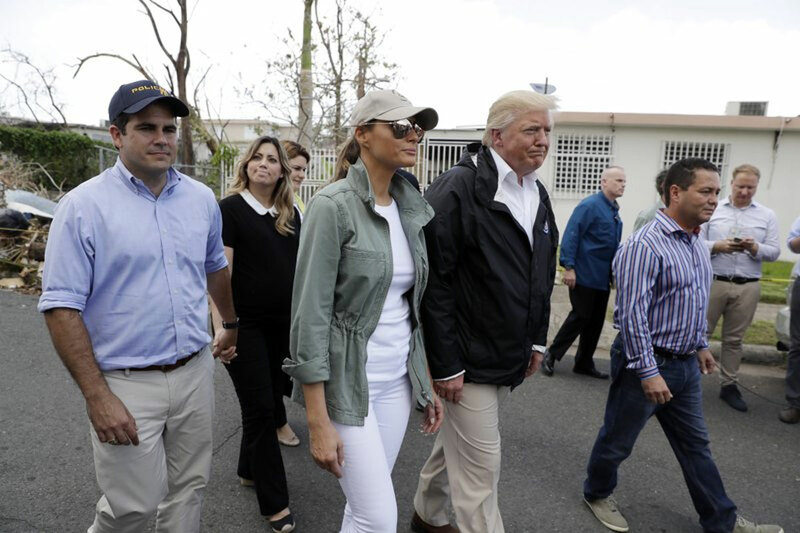 Touring a small slice of Hurricane Maria’s devastation, President Donald Trump congratulated Puerto Rico on Tuesday for escaping the higher death toll of “a real catastrophe like Katrina” and heaped praise on the relief efforts of his administration without mentioning the sharp criticism the federal response has drawn. “Really nothing short of a miracle,” he said of the recovery, an assessment at odds with the despair of many still struggling to find water and food outside the capital city in wide swaths of an island where only 5 percent of electricity customers have power back. The death count of 16 is expected to rise. In the heart of San Juan, in fact, a few miles from the air base where Trump gave his thumbs-up report on progress, people stacked sewage-fouled clothes and mattresses outside houses and businesses lacking electricity nearly two weeks after the storm. “Nobody’s come,” said Ray Negron, 38, collecting debris in the Playita neighborhood. Known deaths from Maria in the U.S. territory stand at 16. But local officials caution that any accounting of death and destruction is far from complete as people suffer secondary effects from thirst, hunger and extreme heat without air conditioning. As for Katrina, as many as 1,800 people died in 2005 when levees protecting New Orleans broke, a toll in lives and property that took years to understand. The visit offered fresh evidence of the unconventional path Trump has taken in responding to the one-two-three punch from hurricanes Harvey, Irma and Maria. His effusive praise for federal relief efforts has overshadowed his displays of empathy for those who are suffering. And in Puerto Rico, in particular, his criticism of local people for not doing more to help themselves has struck an off note during a time of crisis. 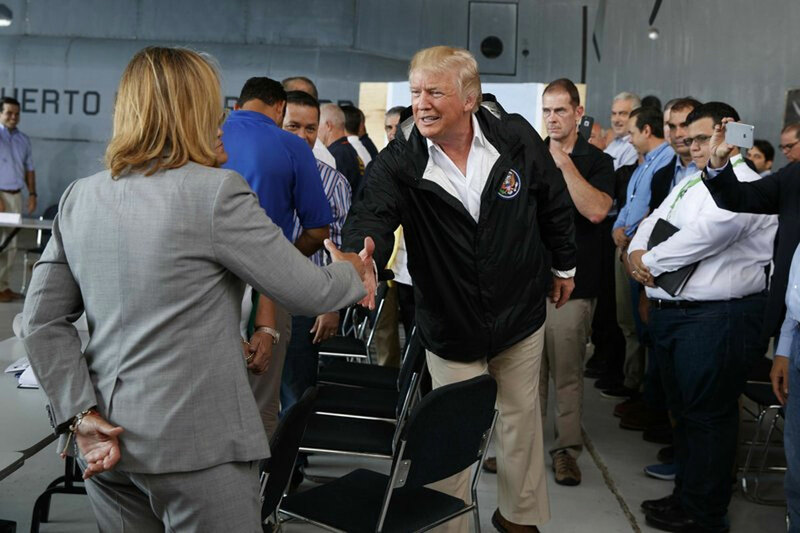 Trump’s most prominent critic in Puerto Rico, San Juan Mayor Carmen Yulin Cruz, joined other officials at the air base for a briefing with him, shook the president’s hand and said afterward she hoped he now understood the gravity of the situation. But his comment implying Maria was not a Katrina-level event left her unsure. Air Force One brought the president, first lady Melania Trump and aides to Puerto Rico for a tour stretching through the afternoon. At least parts of the itinerary were drawn to ensure a friendly reception: Trump visited the houses of selected families waiting on their lawns. In the upscale Guaynabo neighborhood, one of the fastest to recover, 200 people cheered Trump’s visit and crowded around him for cellphone photos. At a table of supplies in a church, Trump tossed rolls of paper towels into the friendly crowd. Asked by AP what he has to say to people still without power, food and water, he spoke of the generators brought to the island and said the electrical grid is being fixed. “Again the job that’s been done here is really nothing short of a miracle,” he said. Earlier, on approach to the airport, Air Force One descended over a landscape marked by mangled palm trees, metal debris strewn near homes and patches of stripped trees, yet with less devastation evident than farther from San Juan. For much of his tour, Trump remained focused primarily on drawing praise. “He didn’t play politics at all,” he said of the governor, making clear that he considers those who have criticized him to be politically driven. Trump misstated Maria as a Category 5 hurricane; it was Category 4 when it hit Puerto Rico. Large-scale protests against Trump, talked about in advance, failed to materialize by early afternoon, with only a few knots of people gathering around San Juan. The trip is Trump’s fourth to areas battered by storms during an unusually violent hurricane season that has also seen parts of Texas, Florida, Louisiana and the U.S. Virgin Islands inundated by floodwaters and hit by high winds. “They want everything to be done for them when it should be a community effort,” he added, scoffing at “politically motivated ingrates” who had criticized the federal work, and insisting that “tremendous progress” was being made. Cruz had begged the administration to “make sure somebody is in charge that is up to the task of saving lives” and said federal inefficiency was killing people. Trump and his wife also visited Navy and Marine Corps personnel on the flight deck of the USS Kearsarge. Even before the storm hit on Sept. 20, Puerto Rico was in dire condition thanks to a decade-long economic recession that had left its infrastructure, including the island’s power lines, in a sorry state. Maria was the most powerful hurricane to hit the island in nearly a century and unleashed floods and mudslides that knocked out the island’s entire electrical grid and telecommunications, along with many roads. The Federal Emergency Management Agency said more than 10,000 federal officials are on the ground on the island, and 45 percent of customers now have access to drinking water. Businesses are also beginning to re-open, with 60 percent of retail gas stations now up and running.
. Trump toured a small slice of Hurricane Maria’s devastation, congratulated Puerto Rico.